Cuffed by You captures the romance, comedy, and drama of the last two books and takes it to a new level. What was the initial idea behind this story and how did that transform as you were writing the novel? It’s funny but one of my readers who has been with me from the start suggested that I use a meme that I posted as a scene in one of my books. That scene ending up being the attempted drowning scene in Addicted to You. To pay homage to my reader I named Kayla after her. Cuffed by You sort of took on a life of it’s own. 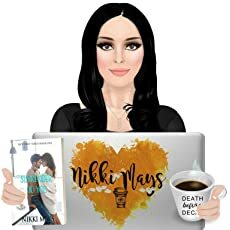 I knew that I wanted Kayla to have her own book because who doesn’t love a good woman who was pushed to the brink receive her happily ever after? Who better than to be brought down by craziness than the series’ man-whore Marc. I thought that it was fitting that he would go from never wanting to person, to ending up with five. Really, the characters took on a life of there own and I was just along for the wonderful ride. I enjoyed the depth of Kayla’s character. What was your process to bring her character to life? I wouldn’t say that I had a process. Being a stay at home mother of three, it was easy to grasp what she would be like daily. All I had to do was add in what I would feel like if my husband ever did that to me and bam, she came to life. I think that a lot of women are able to relate to Kayla regardless of whether they’re married and have kids. What happened to her is a woman’s fear. Of course we want her to come out on top and with a much better man than ever before. The fact that Marc was so sweet and loyal to her children was just a huge plus and is what really stole her heart. It’s easy to guard your own heart, but when someone loves your kids as much as you do…well cupids arrow sticks. I really enjoy the level of detail you give to each character. If Hollywood came knocking who would you cast as your main characters? Hmmm, that’s a pretty tough question. I’m not really sure because I haven’t really based them off of any celebrities. I know that some authors use inspiration boards for their characters but I don’t. Let’s see, I love Alexander Skarsgard, I most certainly wouldn’t mind him playing either Marc or Rocco. Tom Hardy has to be in there somewhere because…Tom Hardy. Luke Evans would be great as Morris. I think Eddie Cibrian would make a great JJ because of his dimples. Tyler Hoechlin would make a great Damon and Declan. He has the body and broodiness of Damon but also the smile and sweetness of Declan. Huh, I guess that wasn’t very hard after all. Thanks for making me look up some hot celebs! What is the next book in the in the SAPD series and when will it be available? The next book in the series will be JJ and Sage’s story titled Protected by You. I’m hoping to have it out by May 5, 2019, but we’ll see. Every Indie author knows that a million and one things can go wrong when it comes to self-publishing, so wish me luck! Kayla has had a pretty crappy year. Cheating husband? Check. Getting arrested for trying to drown him? Check. Getting handcuffed by the world’s hottest cop? Check. Raising four kids alone? Check. Cheating ex-husband being a complete nuisance? Check.